Established in 1908, Zhejiang Academy of Agricultural Sciences is a comprehensive non-profit agricultural research institution. 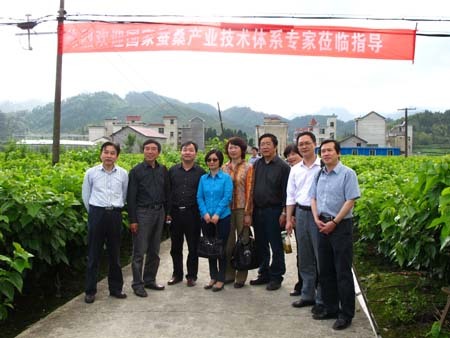 As a province enjoys the reputation of ‘home of silk in China’ for long, Zhejiang attaches great importance to sericulture industry. However, the development and prosperity of the industry has been held back because of the lack of heating facilities, waste of silkworm drugs, poor sterilization and small-scale silk production. In view of this situation, experts at the Institute of Sericulture, ZAAS work closely with their colleagues at Modern Silkworm and Mulberry Industry Experiment Station (Hangzhou) and developed the ’10-Day Silkworm Rearing’ method. They leave the highly technology-demanding and facility-relying stage of silkworm rearing to capable hands of sericulture experts and companies. And hand over to local silkworm raisers the healthy and strong grown silkworms, which are much easier to raise. It will only take 10 days for the silkworm to spin the cocoons after the handover. In this way, farmers will be spared to operate a sideline, and the sericulture industry development is underpinned. According to a survey done by Chun’an Cocoon and Silk Group, compared with conventional silkworm rearing method, the new method can lead to a yield increase by 5kg/egg case, and an increase of economic return by over 100 Yuan per egg case. 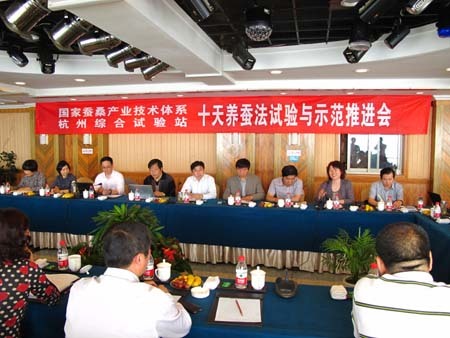 The Experiment Station (Hangzhou) has demonstrated at over 60 counties their brand new method all over the province since 2009, and the one held at Chun’an of May 2-3 has attracted over 40 technology extension workers at the county.